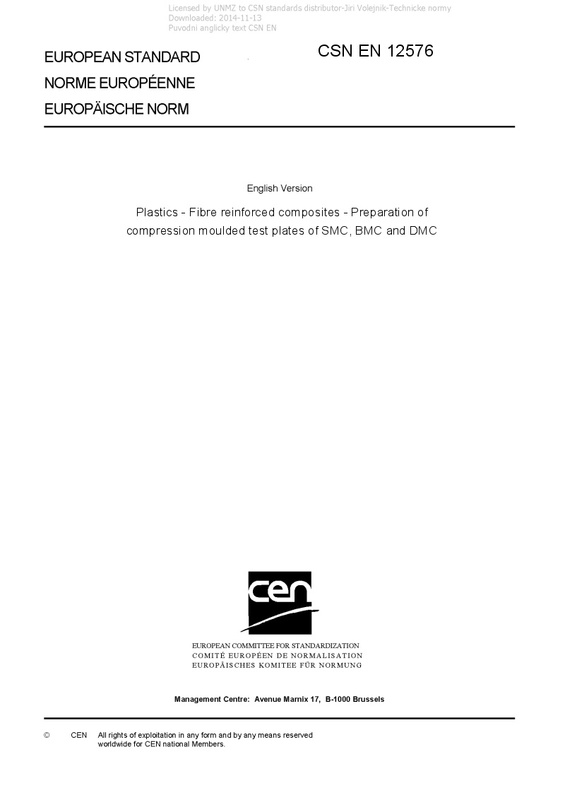 EN 12576 Plastics - Fibre reinforced composites - Preparation of compression moulded test plates of SMC, BMC and DMC - This european standard specifies the general principles and procedures for the preparation of compression moulded test plates from fibre reinforced thermo- setting moulding compounds such as Sheet Moulding Compound (SMC), Bulk Moulding Compound (BMC) and Dough Moulding Compound (DMC). The purpose of this European Standard is to specify the preparation of flat test plates from which test specimens can be machined (for applicable test purposes see informative Annex A). Test plates are being manufactured to give representative results by the different test procedures using specimens machined out of these test plates.